Lum & Abner; The Corn-Stars who will Show YOU The Funny! "Mum, what's that music that plays when I open this page?" If you're not using FRAMES, you're missing out on the other site content. pssst--- "The Roy Acuff Show Collection"
"The Boy Trapper" ebook: Regular Lum and Abner show listeners are familiar with the oft-mentioned "Gilbert, The Boy Trapper." To my knowledge, no book with this exact title actually exists. Nevertheless, second-hand information indicates that script-writer Roz Rogers, needing a title for this fictional book, looked to his bookshelf for aid. Could this book have been his inspiration? There is no "Gilbert" mentioned; however, this title and two other books within the "Boy Trapper" series were reprinted in the early 1900's as a single bound volume. Perhaps Gilbert was introduced elsewhere in the series----? TWENTY-TWO AFRS Melody Round-Up shows can be accessed through my folder on Mediafire. A number of these feature Lum & Abner as hosts. Now you can hear what was on the other side as well. Note that these came directly from transcription discs, and were probably not heard by U.S. audiences. They were produced as entertainment for our service men and women in the Armed Forces in the WWII era. The internet archive at http://www.archive.org has many OTR mp3s for download. Simply type in the name of the radio show you want into their search engine. Thank you Mike Davis for the links! While Lum and Abner endorsed many products, this was not one of them. This is an executable file for Windows operating systems. Sorry Mac users; The authoring program I used does not compile a file compatible with Mac computers. The file is large so give it a little time to load up. Clicking on the cards will enlarge the inset photos. Clicking a second time will return you to the lobbycard. The <ESC> key will exit the program at any time. * Note: This file does NOT contain a virus. Because of the compression scheme used to pack the program into a smaller size, it may trip some virus detectors. Why? Some virus makers use the same compression tool, and ALL programs which use that particular container look alike to certain virus detections programs. Crazy ain't it? 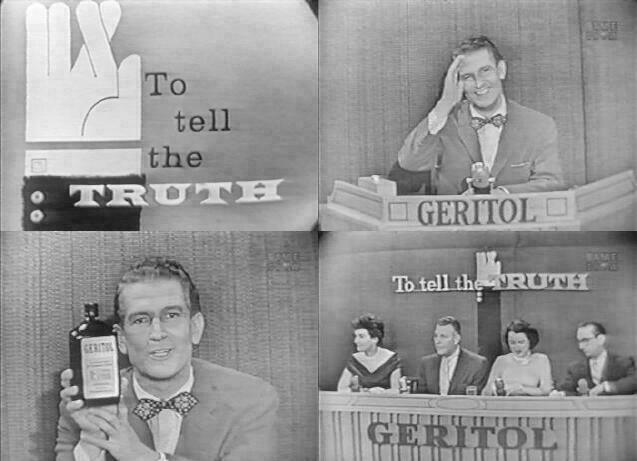 Lum on "To Tell The Truth"
Interesting to note: Hy Gardner asks the contestants if they know "Dinty Doyle". Could he have meant "Betty Boyle," one of the L&A scriptwriters? players including Winamp and Windows Media Player. Or try the free FreeAir MP3 player. The first, foremost, and best place to look for Lum and Abner info. A series of postcards sprang from the popularity "Lum and Abner" program. I'll add to this list as material comes to mind. If you have any additions let me know. Abner (Norris Goff) appeared on the Andy Griffith show? In episode 161 (160) "Opie's Job" Norris Goff appears as Mr. Doakes. Opie vies for a job at the grocery store. "Opie" on the Andy Griffith show received his name in honor of Opie Cates, band leader and actor in the Lum and Abner's half-hour shows? Norris Goff also appeared on Gomer Pyle as his grandfather? Lum and Abner appeared on The Jack Benny Show pilot T.V. show on May 8, 1949 with The Andrews Sisters, Isaac Stern and Margaret Whiting? Chester Lauck and Norris Goff were members of the Order of De Molay, a youth organization designed to benefit fatherless boys? Chet Lauck was a Barbershopper, belonging to the Society for the Preservation and Encouragement of Barbershop Quartet Singing in America (SPEBSQSA)? He also emceed the charter show for the Hot Springs Fun City Chapter, September 17, 1977, with 1,400 people attending in an un-airconditioned auditorium. Elizabeth Taylor's 33-karat Krupp diamond was once offered to Chet Lauck by Vera Krupp, the actress? Grandpa Jones, of "Hee-Haw" and Grand Ol' Opry fame, and banjo-picker extraordinaire, did some of his earliest work in the Lum and Abner house band, "The Pine Ridge String Band" in the early 1930's? Betty Boyle, a Lum and Abner show scriptwriter, operated a ladies' shop at the famed Desert Inn in Las Vegas? That Lum and Abner were National Association of Broadcasters Hall of Fame Honorees in 1983? Chester Lauck and Norris Goff (incorrectly listed as "M"orris) are listed as Theta Sigma alumni alongside notables such as John Wayne, David Letterman, and Tom Selleck? Bea Benederet (Betty Rubble of the Flintstones) played Mrs. Wormley on the Lum and Abner Show? Lum and Abner wrote a song? Before the Lum and Abner radio program introduced the "Jot-em-Down Store," there was no such store in America. Three years after its appearance, there were 100 stores which had obtained permission to use that name! Lum and Abner used the old-fashioned cigar-box type telephone so consistently in their scripts that telephone linemen and engineers throughout the country came to designate that particular type of party-line telephone as "the Lum and Abner line." In October, 1937, news reports identified Lum and Abner as the only radio stars doing three shows a day. They did three a day, five days a week, for three different listening audiences. Also, in October 1937, agents of the FBI investigated a threat to kidnap Chester Lauck and Norris Goff of the Lum and Abner show. The threat consisted of a newspaper clipping of a recent $10,000 extortion attempt on actor Wallace Beery. On the clipping were scrawled the words, "You're next!" The clipping was left at the studio where Lauck and Goff did their broadcast. Lum and Abner were made colonels in Kentucky and Arkansas. In the event of a riot or insurrection, they would have had to go to Arkansas to command a company of milita. Lum and Abner: was the first marathon charity broadcast on radio; the first program broadcast from New York's Radio City; the first international radio broadcast (Lum and Abner talked across the Atlantic Ocean) and one of the first programs broadcast on what would become the Mutual Radio Network. In 1936 THE RADIO GUIDE listed Lum and Abner as the number four program in popularity--bested only by Jack Benny, Eddie Cantor, and Burns and Allen.